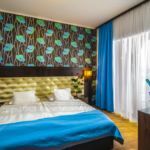 Hotel Termálkristály (Thermal Crystal) Aqualand ****, situated by the Danube, on the territory of the 5-hectare Aqualand complex, has been expecting its guests since April 2011. Our hotel provides an excellent place for relaxation, active recreation, family vacations, but also for conferences and other events. The hot water treasures of the Ráckeve subregion offer many opportunities for quality tourism: the riverbank environment with its ancient trees and the Aqualand complex, offering outstanding services for five years already, can pamper its guests arriving from far away for periods of several days now, since the construction of the four-star Hotel Termálkristály. Not far from the Reform Age part of the town, the hotel surrounded by a park with ancient trees offers services satisfying any requirements and countless benefits of our great treasure: the medicinal and thermal waters, to those seeking active leisure and recreation as well as to lovers of tranquility, silence and harmony. The hotel's Kristály (Crystal) Restaurant provides culinary specialties: the huge terrace of its panoramic á la carte restaurant astonishes and attracts lovers of gourmet food right by the pools, on the shores of the lake (with the pools, lakeside and park illuminated by night). Relax at the Aqualand Adventure Spa, which displays Roman bath culture combined with state-of-the-art technologies of the 21st century. The spacious, bright spa hall includes a thermal-water sitting pool, a thermal-water adventure pool and a 25-m 4-lane swimming pool. The Mediterranean bar of the adventure bath serves the guests and satiates their thirst and hunger during opening hours. Detoxify yourself, get rid of everyday stress in our Vital Zone: aromatherapy steam room, essential oil and herbal saunas, tepidarium with sound therapy and heated stone beds, Kneipp pool and experience showers, then relax on our Mediterranean Vital Relaxation Terrace. 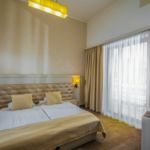 We expect our esteemed guests with opening hours that are unique in the country: we are at your disposal with a wide range of services from 6 am to 9 pm on weekdays, from 8 am to 1 am on Saturdays and from 8 am to 9 pm on Sundays. We pamper you with excellent-quality products in our massage parlour: you can freely choose from a wide range of refreshing, Swedish, Thai and aromatherapy massages. Use of a sunbed is also possible. The experience bath complex awaits sun lovers from early spring to late autumn. Outdoor adventure pools, a sun terrace, deck chairs and parasols help to experience a sensation of maximum relaxation, regeneration and recreation. The demands of water lovers are answered by a family thermal pool with neck showers and water spouts, thermal adventure pools with bubble beds and water mushroom, a thermal children’s pool with adventure elements and a mini slide, pool with a current channel, water volleyball pool, outdoor swimming pool, thermal-water sitting pool and a medicinal-water sitting pool. Ideal relaxation place for adults. In the thermal adventure pool, you can order and enjoy the specialties of the Mediterranean aquatic cocktail bar directly from the water. Stepping out of the thermal pools, it is proven that you will experience a whole sensation of being born again. It is a common creed of the people arriving from different corners of the country that the certified medicinal water containing countless healing components is one of the most effective medicinal waters of the country. 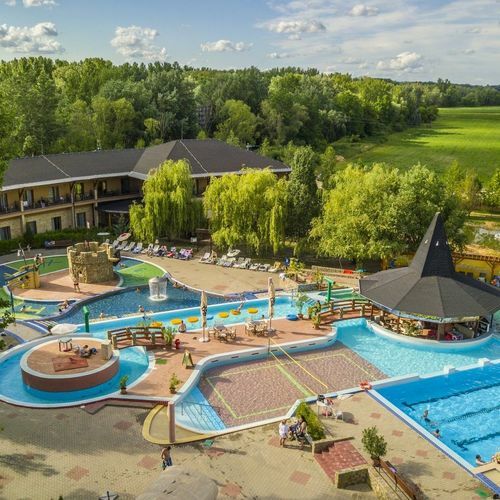 "There are only two places in the country where I feel renewed due to the effects of the medicinal water when I come back: one of them is Aqualand Ráckeve"
Guests of the hotel are entitled to a 10% discount at the Piramis Pastry Shop of Ráckeve! 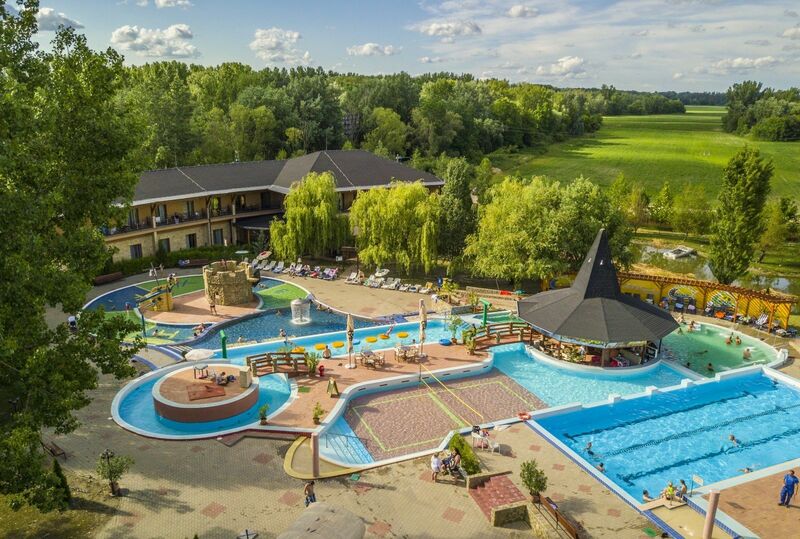 The rating of Hotel Termálkristály Aqualand Ráckeve is 8.9 from the maximum 10, 1102 based on actual and valid guest ratings and reviews. "Az időpont ide-oda rakosgatásáért cserébe kaptunk nagybb szobát, gyümölcstálat, behűtött pezsgőt. Nagyon kedvesek, rugalmasak voltak velünk. A vacsora is és a reggeli is kiváló volt." Kedves Györgyi,nagyon örülünk, hogy jól érezték magukat nálunk, hasonló rugalmassággal várjuk Önöket máskor is. "másnap fizetni kellett a wellnessért,régen ez nem így volt!!!!!!!! régen az étterem svéd asztalos volt ami sokkal jobb volt!!!!!!!!!!" Kedves Gáspár úr, köszönjük szépen kitűnő értékelését. Mindent megteszünk azért, hogy vendégeink jól érezzék magukat nálunk, ezért került például a degusztációs menüsor is bevezetésre. Szállodánk folyamatosan igyekszik lépést tartani a fejlődéssel, és ehhez időnként néhány dologban változtatnunk szükséges. Természetesen ugyanakkor továbbra is az a célunk, hogy Önök elégedetten utazzanak el tőlünk, és vendégeink legyenek máskor is. Örömünkre szolgál, hogy elégedettek voltak szállodánkkal. Várjuk vissza Önöket!